Flame in the Mist: OK so it isn't actually a Mulan retelling necessarily. But there's no denying the similarities. Or the outright dedications to scenes from the film. I mean there is a literal scene where the men all sing about what they miss about women and our main character thinks "their minds". My tiny Disney loving heart was so happy. The true brilliance of Flame in the Mist is in all its originality though. The characters are incredible and multi-layered and the plot is so twisty you'll get lost in it. 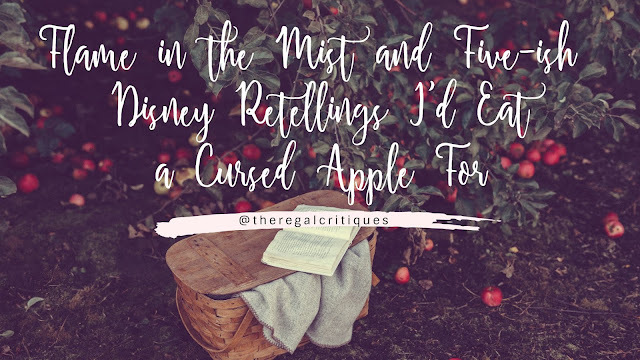 I'd say like a forest of thorns but that's the wrong fairy tale... Also - if I were to get a proper Mulan retelling there'd have to be a Mushu character. Anyway, reading Flame in the Mist has got me thinking about what un-appreciated (or un-adapted) Disney stories really need their own YA retelling. I can't believe there are no YA retellings of this so I'm gonna go ahead and assume I just haven't come across them. But in my head this could do amazing as a contemporary romance story. Like I'm now writing it in my head and I'm already obsessed with the story. So if someone with actual writing skills could get on this I'd be happy! I love all things treasure-hunty and I could totally see a rewrite of this (with more female characters please and thank you) being super entertaining. Imagine Six of Crows meets Tomb Raider and you've got what is in my brain right now. I would read the absolute heck out of this. I nearly forgot this was a Disney movie but then it came at me again and honestly. Who wouldn't love to read this. Now I'm saying this I'm pretty sure there was an actual book that the movie was based on but shush! I need an up-to-date YA fantasy retelling of this and I need it now. So fun fact, I hated this movie when I was a kid. I don't even know why. I just hated it. It's just now occurring to me that I was terrified out of my goddamn mind. Now I think its massively underappreciated and actually really good. And OMG would it make the perfect Dark Fantasy YA. And I even know Vera would love this because it would be absolute chock full of cute pigs. It's basically a survival story meets "destroy the poachers" story so I'm obviously all for it. Plus I'd just be really intrigued to see how this could be adapted. Would it need to stay historical or could it be a modern version with maybe a plane crash a la Beauty Queens? Either way I'm here for it. The Hunchback of Notre-Dame - This could just be so beautiful. The Emperor's Groove - OMG OMG OMG this should have been first on my list. I can't even imagine how this would've worked but I NEED IT! Literally one of the best Disney movies ever! Atlantis - Again SO underappreciated. THE CHARACTERS, the dialogue, the plot. It would all make for such an incredible Sci-Fi YA. Are there any Disney films I've left off that you think desperately need a retelling? This post is awesome, sure Flame in the Mist isn't a strict Mulan retelling but you know there are influences! I'm sure there must be Snow White YA retellings but I found her incredibly boring in the Disney film and I'm sure others must agree. I did like her depiction in the Fables comics as she is way more awesome in them. Emperor's New Groove would be awesome too! I am determined to hunt one out now!